The Belgian royal family's tiara collection is quite small when compared to that of some of their royal relatives and neighbors, but in recent years a few important additions have been made to the vaults. 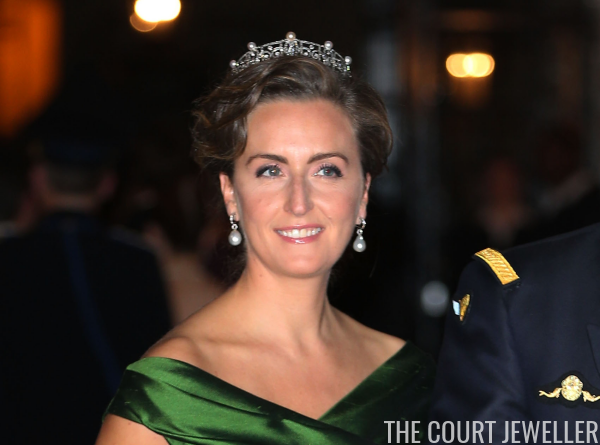 Today's tiara, the pearl and diamond sparkler that belongs to Princess Claire, is one of those jewels. Claire began wearing this tiara in public in 2010. Before that, she exclusively wore her small diamond wedding tiara at white-tie events like state banquets and royal weddings. This newer tiara is still petite, but it's much larger and more detailed than its predecessor. The tiara is notably architectural, featuring fleur-de-lis patterns against a set of vertical lines, topped by half-pearl buttons. To my knowledge, no provenance information about the tiara has ever been released. Claire premiered the tiara in public at a major bejeweled event: the wedding of Crown Princess Victoria of Sweden in June 2010. She brought the same tiara with her to the wedding of Prince Albert II of Monaco the following year. 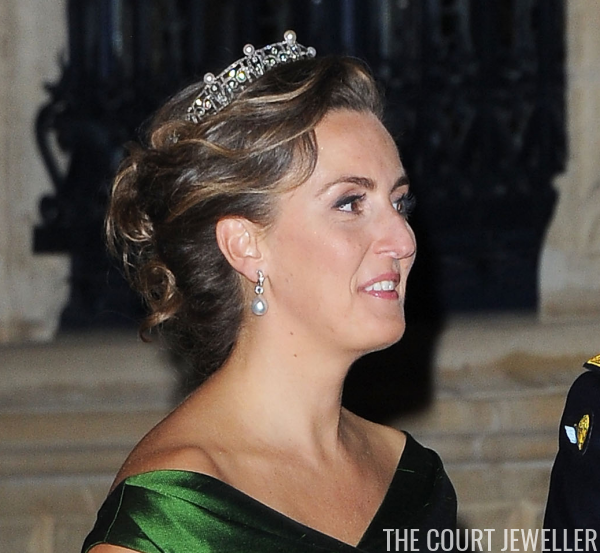 She also paired the tiara with a green dress -- and, as usual, her diamond and pearl wedding earrings -- for the wedding of her husband's cousin, Hereditary Grand Duke Guillaume of Luxembourg, in October 2012.